Technological advances have significantly changed the solar PV sector. The year 2018 saw the widespread adoption of the sensational PERC fabrication process, which has become a major contributor to the overall increase in cell efficiency. Around the same time, major solar enterprises introduced many small-scale enhancements to their product design and production processes. Their efforts in turn have resulted in a much greater diversification in the future development of technologies at the component level. Some of the more noticeable innovations include half-cut cells, paved cells, shingled cells, MBB, glass-to-glass modules, and bifacial modules (cells). Because of these modifications made to the cell and module templates, PV modules in 2019 generally will attain power outputs that are one to two bin classes higher than the power outputs of modules in 2018. With the innovations that are taking place, the levelized cost of electricity (LCOE) remains central to the competitiveness of all solar products. 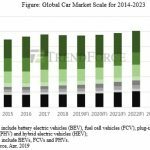 Reducing LCOE primarily involves raising the conversion efficiency of PV cells as well as the power output of PV modules. While solar enterprises pursue technologies that take generation to a higher level, they also have to consider the long-term reliability of these solutions and continue to drive down the production cost. Bifacial modules were first revealed at SNEC 2017 in Shanghai. During that event, nearly all exhibiting solar companies presented the most advanced technologies that they had developed in-house. However, it was not until the fourth quarter of 2018 that solar companies began to incorporate these technologies into their capacity expansion and utilization plans. The main driving force behind the importation of innovations into the cell and module production processes was China’s Top Runner Program, which had been reoriented to strongly promote the use of leading-edge technologies. Also, the related equipment and material solutions were finally available in the fourth quarter of 2018 to allow the application of new designs and fabrication processes across the whole sector. All in all, these two factors helped trigger the rapid market penetration of bifacial products in the recent period. According to the latest research from EnergyTrend, 17.4GW of the global production capacity for PV modules was allocated to the production of bifacial modules in 2018. However, the actual production of bifacial modules worldwide for the same year is estimated to have been much less than that amount. As mentioned before, solar enterprises only started to incorporate leading-edge technologies such as bifacial modules (cells) into their capacity plans in the fourth quarter of 2018. The actual production of bifacial products for the same year is therefore estimated to have been under 4GW. EnergyTrend’s shipment tracking data also reveal that LONGi and Solargiga are the leaders in bifacial module (cell) shipments. Their respective annual totals for 2018 reached nearly 1GW. On the other hand, the combined shipments from other manufacturers for the same year came to no more than 2.5GW. These shipment figures indicate that the growth of bifacial modules (cells) was still at a nascent stage during 2018. Whether the competition among manufacturers to raise bifacial shipments will intensify is something that the market will be paying attention to during 2019. Based on manufacturers’ own projections, the global production capacities for P-type and N-type bifacial products will reach 27GW and 10.7GW respectively in 2019. The bifacial technology may be able to provide a much higher power output gains compared with other leading-edge technologies, since it allows modules to generate electricity on both the front and rear sides at the same time. This advantage is further highlighted when it comes to assessing and optimizing LCOE. 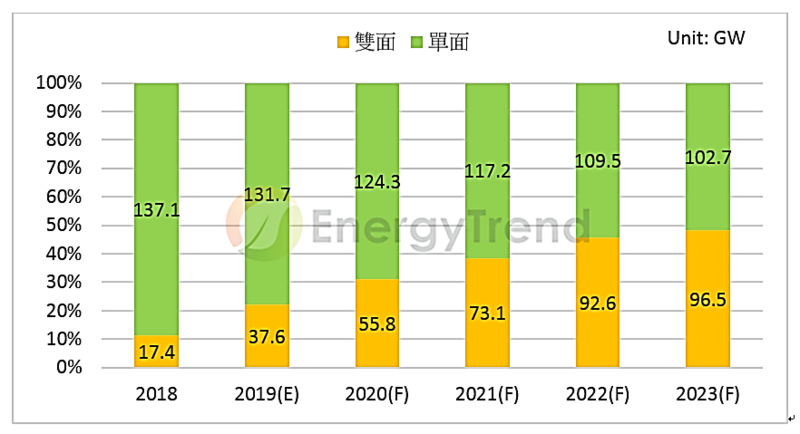 EnergyTrend thus expects the global production capacity for bifacial modules (cells) to expand at annual rate of 10% or higher over the next three years, perhaps eventually reaching parity with the total capacity of traditional monofacial products. The table below demonstrates the possible contribution from bifacial products to the profitability of a solar project and the optimization of LCOE. It lists the increases in the internal rate of return (IRR) for every 5% power output gain produced by the rear-side generation, assuming that the project is 100kW in scale and deploys 300W bifacial modules (i.e. 300W output from the front side). The calculation of the output gains produced by the rear-side generation is based on experimental data and does not distinguish between P- and N-type products. The 5-30% range is taken as an example and covers the magnitude of the possible contribution from the rear side. Furthermore, the benchmark for the IRR calculation assumes that the terms of financing the project are consistent with the environmental conditions. The only variable in the projection model is the power output of the module. As the table indicates, the increasing output gains also lead to a linear growth for IRR. This in turn confirms that bifacial modules can help solar project developers to achieve an optimal LCOE. Bifacial products have attracted the interest of energy investors worldwide. The European Bank for Reconstruction and Development (EBRD), for example, has been very bullish about the potential of this technology in specific regional markets. 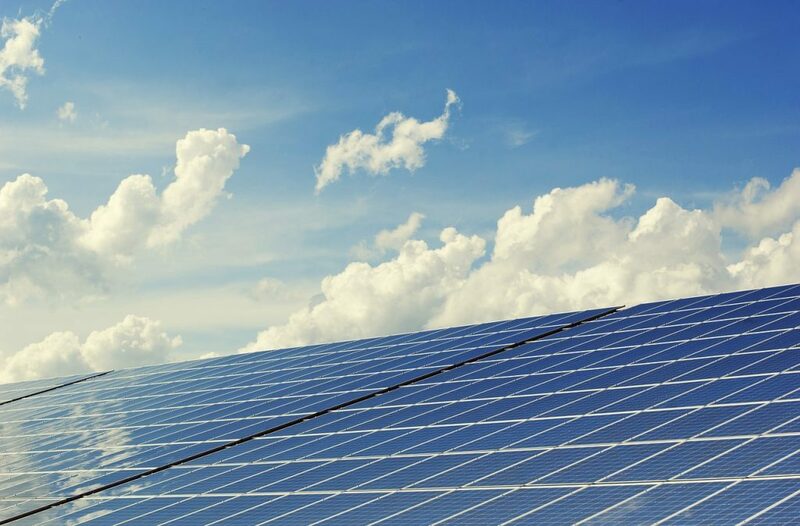 Recently, EBRD made the decision to co-finance a 300MW bifacial solar project in Egypt. Ahmad El Mokadem, a principal banker at EBRD, said that while the per wattage cost of bifacial products are higher than that of monofacial products, the former are much more suited for deployment in Egypt. The desert areas of the country offer an environment that is plentiful in both direct and reflected sunlight. The rear side of a bifacial module can absorb not only the light reflected from the ground but also the irradiance from the neighboring modules, thus producing substantial output gains. The statement from the principal banker also reflect the general view of investors that the development of bifacial solar projects warrants support at the current stage because the inherent risks of the technology can be managed and further mitigated under the right conditions. Indeed, the use of bifacial products will likely significantly raise the overall rate of return for projects located in the deserts of the Middle East and Africa. 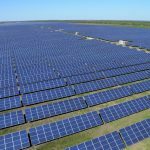 As one of the major manufacturers of the bifacial products, LONGi also announced earlier this year that it will participate in the construction of the largest “bifacial plus tracker” project in the US. Located in Michelle County in the state of Georgia, this project is designed to have a generation capacity of 224MW and consists of PV systems that combine bifacial modules from LONGi and a tracker mount. The desert environment where the project is situated provides the high reflectivity that maximizes the rear-side generation of bifacial modules. At the same time, the tracker mount further raises the overall power output of the whole system. LONGi estimates the output gains produced by its bifacial modules and the tracker mount to be around 10% and 15%, respectively. The two solutions together thus result in an increase of around 25% in the generation of each PV system installed in the project and a substantial decrease in LCOE. Like the 300MW project in Egypt, LONGi’s “bifacial plus tracker” project in the US is another typical case study proving that the adoption of the bifacial technology brings huge economic benefits.